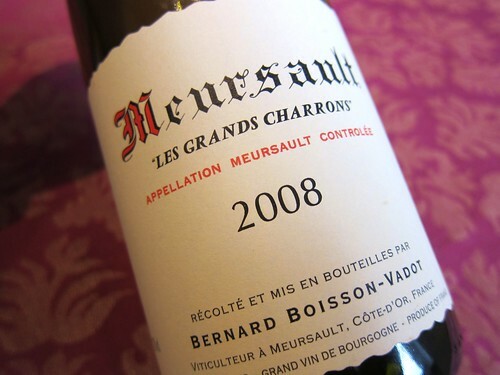 2008 “Les grands Charrons”, Meursault, Bernard Boisson-Vadot – Chardonnay unplugged! On to our first dry white wine we had for Christmas. This bottle by relatively unknown winemaker Bernard Boisson-Vadot was recommended by one of my regular online-wine-shops here in Germany, promising lots of bang for the buck. How does Boisson-Vadot work his vines and wines? This blog post (in French) describes that the estate is maturing its whites for up to 21 months on the lees which supposedly adds complexity. Another post (in French as well) explains that vineyards are worked in a traditional way without chemical fertilizers, and including plowing of the soils. Also, Boisson-Vadot only uses very few new barriques for the élevage (25% maximum) for maintaining a very pure expression of the grape. But beside these posts, and the retailer infos, there’s not much information to be found on the winery. So let’s just get to the wine.